My set brief for Trua is partly inspired by Scandinavian folk-lore and the creatures that typically inhabit the grounds, both mythical and real. Below are some of the animals I found most fitting to focus on as well as child-friendly myths I thought would take an interesting approach to read into and potentially design in a print. My favourite animals I intend to take forward being highlighted. Huldra (or called Tallemaja in Swedish) is a troll-like woman living in the woods. She is fair and beautiful, but wild and has a long cow-tail which she hides behind her back upon meeting a human. It is said that Adam and Eve had many children, and that one day, when Eve was giving her children a bath, God came to visit. Eve had not finished bathing all of her children, and so hid those who were still dirty. God asked: “Are there not more children?” and when Eve said no, God said: “Then let all that is hidden, remain hidden,” and the hidden children became De Underjordiske (the ones living underground), lost souls who live under the surface of the earth, calling for someone to be with them, usually human passersby. 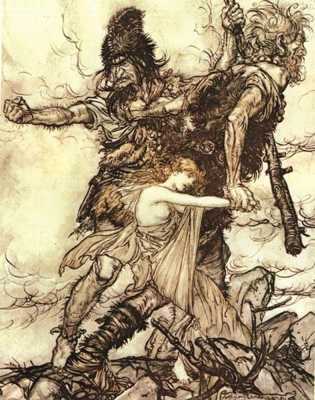 Huldra was one of them, but she somehow remained above the ground. She is a flirtatious, young girl who is neither good nor evil. The dwarves and the elves originate from Norse Mythology. The dwarves lived in their own part of Midgard; a place no human could find. They were small people, often pictured as little men with long beards, who were master smiths, and made the swords, shields and armor for the gods themselves. 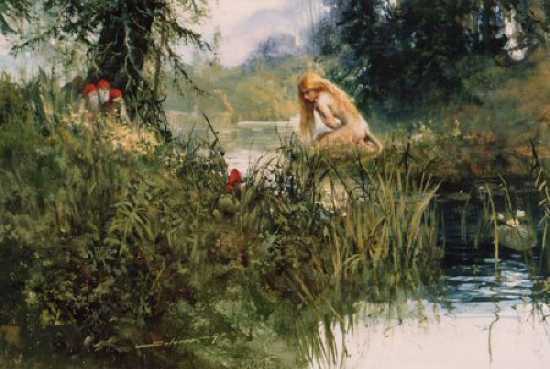 The elves lived in a deep forest nearby the castle of Frøy, the god of fertility, called Alvheim. They were fair and beautiful, and commonly seen as peaceful creatures. Fossegrimmen, or just Grim (Foss is Norwegian for Waterfall) is a water-creature. 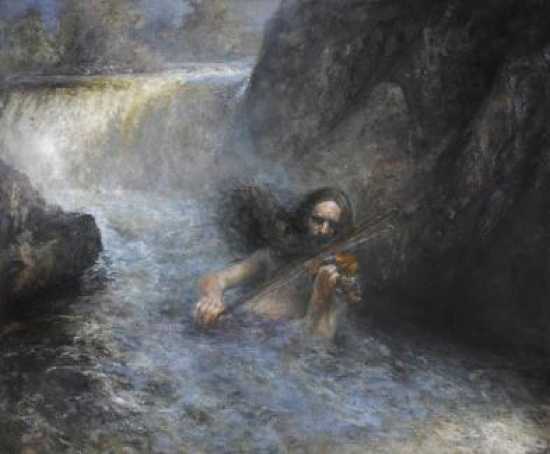 He is a young, handsome man who sits naked under waterfalls, playing the fiddle. He plays the music of nature itself; the sound of the water, the wind in the trees, it all comes from his music. He is said to teach humans how to play if they secretly brought him a stolen piece of meat. Torgeir Augundsson (1801-1872), better known as Myllarguten, was a famous fiddle-player from Telemark, Norway who was so good it was rumored he had sold his soul in exchange of Fossegrimmen’s skills. The troll comes from Norse Mythology, inspired by the cruel giants who were the main enemies of the gods, known as jotner/jotuner/jötunn, who lived in the mountains of Utgard. They have a human like appearance, but they are incredibly ugly and huge, and every story about them tells of how stupid they are. In the old tales, there were trolls of all kinds, some living in the high mountains, in castles carved out of the stone, in deep forests, and some even by the shore. Upon the arrival of Christianity around the 1300s, the stories changed. The trolls were able to smell the blood of a Christian man, and basically they stood for anything of the old times, which the new religion condemned. Oh, and if they every came in contact with sunlight, they turned to stone. Kraken is probably a creature most people will recognize. It’s been used in several movies, like Pirates of the Caribbean and Clash of the Titans, but originally, the Kraken belongs in the cold Norwegian Sea, where it was first said to be seen in the early 1700s. The first detailed description was made by the Danish writer and biologist, Erik Pontoppidan, in 1752. In old times, the Kraken was said to be in the shape of a huge crab, the size of an island, and many sailors and fishermen found themselves stranded on an island that had not been there minutes before. 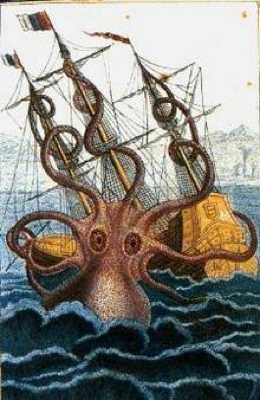 Later descriptions tell of a monster in the shape of an enormous octopus, which dragged ships down to the bottom of the sea. 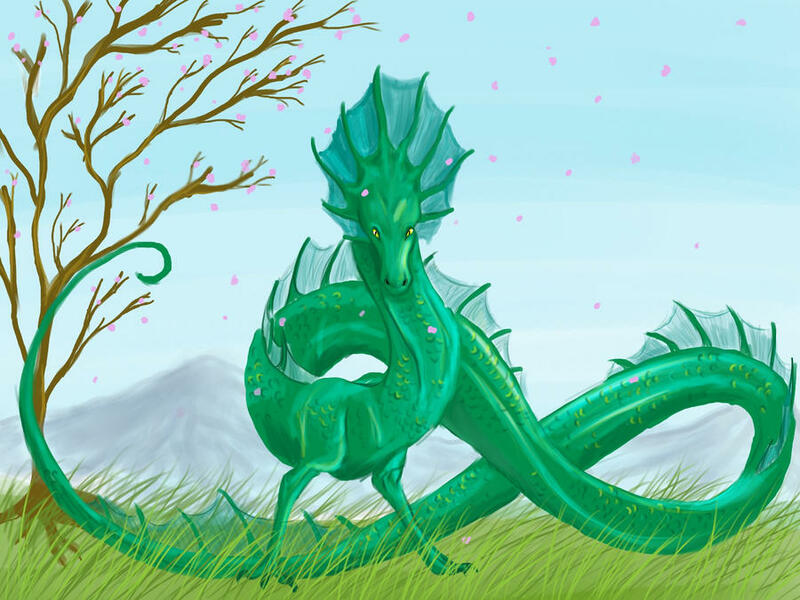 A lindworm is either a dragon or serpent monster. 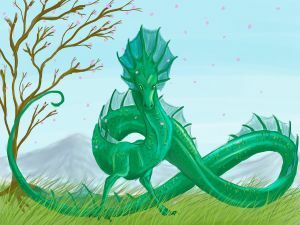 A lindworm’s appearance can vary from country to country and from tale to tale, but the most common depiction of lindworm is a wingless lindworm with a serpentine body, a dragon-like head, scaled or reptilian skin and two clawed arms in the upper body. The most common depiction of lindworms implies that such lindworms do not walk on their two limbs like a wyvern, but move like a mole lizard: they slither like a snake but they also use their arms to move themselves. Saxo Grammaticus begins his story of Ragnar Loðbrók, a semi-legendary king of Denmark and Sweden, by telling that a certain Þóra Borgarhjörtr receives a baby lindworm as a gift from her father Herrauðr, the Earl of Götaland. As the lindworm grows, it eventually takes Þóra hostage, demanding to be supplied with no less than one ox a day, until she is freed by a young man in fur-trousers named Ragnar, who thus obtains the byname of Loðbrók and becomes Þóra’s husband. The Seven Foals (in Norwegian : De syv folene) is a Norwegian fairy tale collected by Peter Christen Asbjørnsen and Jørgen Moe. A poor couple had three sons, the youngest of whom would lie about in the ashes.The oldest went to the king to enter his service. The king set him to watch his seven foals all day and find out what they ate and drank. If he succeeded, he would marry the princess and receive half the kingdom; if he failed, he would have three strips taken out of his back.The next morning, he had to chase after the seven foals and grew so tired that when an old woman, spinning, called him to stay with her and let her comb his hair, he did. In the evening, he was going to return home, but the old woman told him the seven foals would come back this way, and gave him moss and water to give to the king as what they ate and drank. The king had three stripes cut from his back and salt rubbed in them, and the oldest son went home.The middle brother tried next, but it went with him as with his older brother. The youngest brother decided to go, which made his brothers jeer at him and his parents plead, but he went. He took the same job as his brothers, but ran past the old woman, at which the youngest foal told him to ride it, because they had far to go. They reached a birch tree, and in a room inside it there were a sword and a pitcher. The foals asked him to wield the sword, which he could not, until he had drunk three times from the pitcher. They then made him promise to cut off their heads on his wedding day, because they were the princess’s brothers, a troll had enchanted them into this form, and that would free them. Then they went on to a church where they received bread and wine from the priest, and the youngest son took some with him when they left. When the king received the bread and wine, he made arrangements for the wedding, and when the youngest son cut off the foals’ head and restored them as princes to their father, the king promised him the entire kingdom after he died. “Three Billy Goats Gruff” is a Norwegian fairy tale. The fairy tale was collected by Peter Christen Asbjørnsen and Jørgen Moe in their Norske Folkeeventyr, first published between 1841 and 1844. The story introduces three male goats, sometimes identified as a youngster, father and grandfather, but more often described as brothers. In other adaptations, there is a baby or child goat, mama goat and papa goat. In any case, there is almost no grass left for them to eat near where they live, so they must cross a river to get to “sæter” (a meadow) or hillside on the other side of a stream in order to eat and fatten themselves up. To do so, however, they must first cross a bridge, under which lives a fearsome and hideous troll, who is so territorial that he eats anyone who tries to cross the bridge. The smallest billy goat is the first to cross and is stopped abruptly by the troll who threatens to “gobble him up!” However, the little goat convinces the troll to wait for his big brother to come across, because he is larger and would make for a more gratifying feast. The greedy troll agrees and lets the smallest goat cross. The medium-sized goat passes next. He is more cautious than his brother, but is also stopped by the troll and given the same threat. The second billy goat is allowed to cross as well after he tells the troll to wait for the biggest billy goat because he is the largest of the three. The third billy goat then gets on the bridge and is stopped by the hungry troll. The troll threatens to devour him, however, the third billy goat challenges him and knocks the troll off the bridge with his horns. The troll falls into the stream and is carried away by the current. From then on the bridge is safe, and all three goats are able to go to the rich fields around the summer farm in the hills, and they all live happily ever after. For further reading, I suggest this link of a specific background history on animals in Nordic Mythology click here.